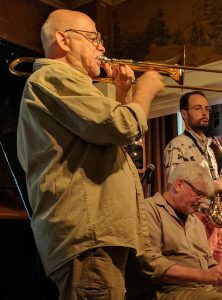 Sam Burtis has been a freelance lower brass player, arranger, composer, music director and educator in New York City since 1967. He plays all sizes and styles of tenor trombone plus bass trombone (five absolutely wonderful S.E. Shires instruments in all) , euphonium and tuba, and a full resume will soon be up on this site. Meanwhile, suffice it to say that he has played, written and taught at the very highest levels of the NYC freelance scene…specializing in North, South, Central and Caribbean American playing styles but by no means limited to them…for over 40 years. Sam has played with a variety of orchestras. His arrangements and compositions have been played and/or recorded by The Lee Konitz Nonet, The Charles Mingus Big Band (of which he was the original music director), numerous Tito Puente ensembles, the Larry Harlow Band, the Chico O’Farrill Afro-Cuban Orchestra, the Mike Longo New York State of the Art Orchestra and many other groups as well. Sam started posting his ideas about music on the web in the late ’90s under the pseudonym “Sabutin”, and the general popular acceptance of what he was saying among brass players led to a whole new career as a teacher. Mr. Burtis has performed on innumerable commercials, records and in at least forty Broadway and off-Broadway shows during his time in New York, has been associated with both the New School and The Mannes School of Music in New York City, Prince Klaus Conservatory (Groningen, Holland), Lehigh University and the New Jersey Performance Arts Center/Jazz For Teens program as a brass and music theory/composition/American musical idioms teacher, has taught many private students both individually and in clinic situations, and has (most often under the web name of Sabutin) contributed hundreds of columns and posts on advanced techniques of playing the trombone to his own sites The Open Horn (a pan-brass discussion forum) and SamBurtis.com, plus The Trombone Forum, The Online Trombone Journal and The British Trombone Society Forum.